Who never wears a helmet? And why don't you wear a helmet? Organ donors I would assume. I wear a helmet because I prefer my brain in my cranium as opposed to spread all over the highway. Fools ride without them. No choice! ..................... But I would anyway. I never have worn a helmet. I have one accident (not my fault) under my belt. It's a tricky question because it seems to really polarize folks. My reasoning is: Helmets reduce my peripheral vision and eliminate my ability to hear. Further, they haven't invented a neck protector. Any wreck bad enough to do that kind of damage to my skull is very likely going to break my neck anyway. Like seatbelts in a cage, use of helmets or not begets controversy. When I see those road signs that state, BUCKLE UP... I say YES, buckle up. We motorcyclists DON'T need you ejected from your vehicle and hitting us riders. The question is not tricky! As note above it does make folks take sides for or against. Yes, you do have to turn your head a little further to see and execute necessary checks. 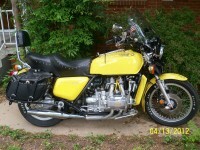 One of the wonderful aspects of the Gold Wing is the quietness of the bike which greatly enhances ones ability to hear. I would urge you to do some study on head injuries and concussions to learn how small an impact to the head is required to cause damage. A helmet is not perfect nor is a seatbelt but both can measurable improve your chances for survival in a crash. You live in a state with a mandatory helmet law. It's accepted that you do wear a helmet when riding a motorcycle. 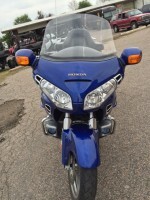 If you're riding across country, who would likely remove their helmet when riding through a state with no helmet law? And why would you do that? Always a topic that guarantees conflict and controversy . Almost as bad as trying to discuss the 2nd Amendment and gun rights with a left-wing radical , anti-gun advocate . In my fifty-five years of riding ; this subject is a one ; or the other . With absolutely no middle ground from one side . And one side only . Those who support mandatory helmet usage seem to think they have the right to every other rider that they are dumb , stupid , ignorant , Organ Donors , sub-human knuckle draggers , and a plethora of other names , not fit to print here . Sad . Very , very sad . I was heavily involved in the crafting of the Ohio helmet laws way back before many on this board were old enough to throw a leg over , and the one thing we sought was the "MIDDLE GROUND", that was acceptable to the riders , law-makers , and Insurance Companies . I think we got it right , cause there has been but a minor amount of tweaking to that law since . And I commend the tweaks . As they were directed at keeping new , and younger riders safer . I am not against helmet laws . Just pious , holier-than-thou Hypocrites who would , and do "bag" there helmets as soon as they cross that state line into a helmet free state . But play the "I ALWAYS WEAR MY HELMET", and "EVERYBODY ELSE SHOULD HAVE TO , TOO" card at every opportunity . 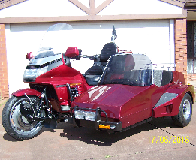 I see it every year at Arizona Bike week , and the Laughlin River Run . And please don't try to tell me that's just the H-D crowd . I've been to over a dozen ABW's and 20 River Runs . Not buyin it . Simply stated . No ! I do not wear a helmet unless I am in one of those Blue-state , Nanny states where one over-bearing , over-reaching political party thinks they have the right to tell me when to think , what to think , and how to think . I've logged almost four million miles on a motorcycle and the only injuries I've gotten was the two accidents I was wearing a helmet . Neck injuries due to the weight of the helmet displacing and separating C-4 and C-5 vertebrae . For all you folks who like to quote data , and safety reports , go way back to around 1973 and get the British data on fatal crashes in the U.K... If memory serves ; there were approx. 110 riders killed in a two or three year period . Over 80% of those fatalities were the direct result of spinal separation between the 3rd and 5th cervical vertebrae . Anybody want to take a guess what is the only item that touches that part of the human anatomy , in a motorcycle wreck ? The bottom of your freakin HELMET . We used that data in arguing our case for the Ohio Helmet laws . Get over yourselves ; and let others live as they choose . "Let those who ride" --- DECIDE ! My opinion was asked for and I have stated it , clearly , and succinctly . If it offends you , that's on you , as I was highly offended by some of the snarky comments I've read in this thread . Brain-dead , Brain-bucket wearin morons who think they have a license to be insulting to anyone who disagrees with "their" point of view . The word FREEDOM has a million definitions, this was one of them (slight RIP from Dragnet). Ah, found it... "Unsubscribe topic"
Last edited by FM-USA on Fri Jun 30, 2017 10:06 am, edited 1 time in total. Always a topic that guarantees conflict and controversy. That's what I was looking for!! A little bit of constructive conflict and controversy, to spice things up. MANY years ago, in the bike shop where I bought my first bike, there was a sign by the helmets that said, "If you have a $10 head, buy a $10 helmet." I think most riders, unless they have a good head bunt (like, say, Gary Busey) can revise that quote to a ZERO value helmet. "Most folks who don't think they need a helmet probably don't." As I recall, that was the advertising slogan for Bell Helmets at the time. Don't worry about dying, you're gone. Don't worry about brain damage what's left of you won't care. But nobody thinks about the other injuries. A number of years ago while out on a Sunday fun run with friends, I had a major malfunction at freeway speed. Long story short, after 3 months in the hospital I'm home and checking out what's left of my helmet. The entire left side of my full face helmet from chin bar to brow vent was road rashed severely (and not just the paint). Without my helmet that day, that ride, that instance, my face would be something from a horror movie today. That being what it is, I will fight for your right to ride helmet free, BUT I will make you listen to my story before you ride off. My personal 2 cents. The operator should have the right to choose, but not the passenger. My reasoning, the operator has control of the machine and has the passengers life in their hands and skills. At 17 years old, I had a pickup truck turn left in front of me. I went over the hood of the truck, more or less flipped in the air, landed on my feet - still doing 30+ mph, and immediately slammed face first into the road. I slid on my front for a bit (don't remember this, but my jeans were worn through to the skin in front), and then must have tumbled, because I distinctly remember sliding along on my back, until I hit the curb, head first. I learned two lessons that day: 1) jeans don't protect at ALL against road rash, and 2) wear a helmet if you want to live. My life would have ended at 17 years of age if I hadn't been wearing one. The amount of damage my helmet took, while leaving my head completely unscathed made me a huge believer in helmets. I always wear a helmet and not because of any law or political opinions relating to the laws. Most of the time I use a 3/4 because they are so much cooler. One of the prerequisites when purchasing is related to the peripheral vision argument. There are helmets out there that don't block your vision. I can't see the sides of my helmet except for the extreme lower portion. No blocked vision at all. Since this thread is for those who never wear a helmet I won't submit this post. I wear one 99% and am nervous if I don't. Took the grand daughter out last evening and she wore the helmet I use. Felt good in great weather but it was like eating clowns. Tasted funny. Friend flew over a car three years ago. No helmet. Still blind. Your math is a little off ; but close . 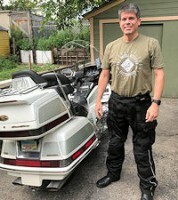 I've been riding for 55 years and my motorcycle has always been my primary transportation . 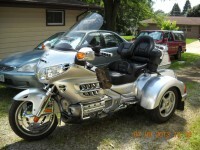 Many own motorcycles as a weekend recreational vehicle , but I'm not one of , "those guys" . For years ; my daily back and forth to work was 145 miles . Buy gas for a cage for that trip for a year . 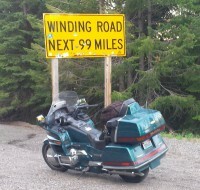 The only state I haven't ridden in is Alaska ; and I've logged a almost trans-Canada trip back in the days when you didn't have to have a passport to go there . And gas stops were not within reach of your tanks capacity . Phoenix to Cleve. , Ohio to Montreal to Calgary and back down to Phoenix . And people spent more time behind a set of "bars" , than a key-board . Couple of short trips into Mexico , just cause it was close , and not the political issue it is now . I rode for the simple pleasure of riding . 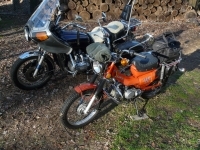 I've crossed country on Triumphs ; Ariel Square-four , Norton's and Honda's and like the catch phrase , it was about the ride . Had the pleasure of riding two Vincent's . A Black Knight and a Shadow . A Suzuki Rotary , and one of the first 750 Tridents in the country . I was a long-haired , dope-smoking , stretched front-end , chopper-ridin "Biker" , before "Easy rider" hit the big screen . And yup ! Even spent some days in some local county jails , livin the life-style . No big thang .....Don't mean nothin . Rode "Patched" , and solo . But I rode . Pretty simple really. Should just be the rider's choice. Same with seat belts in my opinion. I always wear a helmet but it doesn't bother me if anyone else does or doesn't.